1/2 Pound insulation, Open cell insulation , Low density. 2 Pound insulation, Closed cell insulation - Medium density. - 6.9 R-value per inch (25 mm). More than R-20 for a 2x4 inch wall cavity!! Closed Cell spray foam is also referred to as 2 pound or medium density. This foam seldom requires trimming with little to no waste. Closed cell foam cures rigid and the millions of microscopic bubbles which form during the expansion reaction remain closed and intact. This traps the reaction gases, and as such the R-value of closed cell foam is close to that of the reaction gas, around R-7 per inch. The closed cell structure is very strong; increasing shear and racking strength by 300%. Closed cell foam is an approved vapour barrier as defined by code. Both, open cell and closed cell foam spray are applied as a liquid to create an air-tight seal as it expands to a foam which stops air leakage. But unlike open cell foam, closed cell foam stops both convection through and within the wall cavity. 1/2 Pound insulation - Open cell insulation - Low density. 2 Pound insulation - Closed cell insulation - Medium density. This type of insulation is mixed on the job site by the installer. The liquid foam is sprayed directly onto the building surface or poured into enclosed cavities using a spray gun driven by a pump. The foam expands in place and sets in seconds. Spray foam insulation should be installed by a trained contractor or installer. 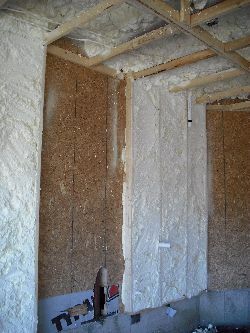 Open Cell spray foam is also referred to as ½ pound or low density. This foam requires trimming and disposal of the waste. Open cell foam cures soft and the irregular bubbles which form during the expansion reaction are broken or open. These cells or pockets fill with air, and as such the R-value of open cell foam is close to that of dormant air, around 3.6 per inch. The R-value of open cell foam is close to that of conventional fiberglass and cellulose insulation because they all use the same principle of trapping dormant air. However open cell foam is more effective than conventional insulation because it is spray applied as a liquid which conforms to fit the wall cavity. Like conventional insulation open cell foam only slows down convection through and within the wall cavity. Open Cell foam is not a code approved vapour barrier. - 6.9 R-value per inch (25 mm). More than R-20 for a 2x4 inch wall cavity, Approved vapour barrier as defined by code.